Posted by dr. gonzo in Horse Slaughter. News from the horse slaughter front. Posted by dr. gonzo in BlogNotes, Horse Slaughter. Of local interest, the latest on the House anti-horse slaughter legislation can be found here. This post is archived in the horse slaughter section. Pending legislation in the U.S. House of Representatives has seen some recent action. Posted by dr. gonzo in BlogNotes, Horse Slaughter, Writing. Nothing too spectacular today. A short post on horse slaughter. It looks likely that the anti-slaughter bill that has lingered in committee for more than a year may come up for a vote sometime after July 10. I added two short excerpts from my other novel. If you read them bear in mind they have not been through the rigorous edit process I normally put these things through. I have added permalinks for the horse slaughter informational page. Each entry is linked to a date and description in the sidebar on the right of the horses page. Two posts today, Chernobyl below and I did a pretty lengthy write up on horse slaughter, responding to a Montana letter to the editor and updating the status of current, federal horse slaughter related legislation. I posted about Tuesday’s U.S. District Court decision to dismiss the majority of a lawsuit against the USDA which would have stopped the fee-for-service program they established to allow horse slaughter to continue in the United States. Check it out on the horse page. Horse slaughter is back in the news and I recently completed an interview with Gail Vacca. She is the Illinois Coordinator of the National Horse Protection Coalition. Gail answered a few questions about the USDA’s announcement of a fee-for-service program allowing horse slaughtering to continue unabated, some questions about her general stance on the issue, and some background questions. Big breaking news of local interest. The USDA will circumvent “Congressional intent” to stop horse slaughtering by staving off funding for federal meat inspections. The USDA’s Food Safety and Inspection Service agency will set up a fee-for-service inspection program to deal with the cut of federal funding for horse meat inspections. Check out my post on it here. Thanks to Gail Vacca for the heads up. Coming Soon: Look for an interview with the Illinois Coordinator of the National Horse Protection Coalition and, later in the week, an in depth look at the exploitation of natural resources (i.e. gas, oil, coal, wood) in the Allegheny National Forest located in northwestern Pennsylvania. I’ve written some lengthy updates to the horse slaughter updates page recently. The whole thing is pretty good background along with a couple of the posts that I regualrly reference on the updates page. Just thought I would point it out. I guess the whole aim of these four posts was to provide a bit of context for horse slaughtering in the United States. Year after year state and federal legislation aims to eliminate it from American commerce, this year is no exception as, again, the controversy rages. Holy crap! This is so fun, anyone could leave some comments now and again, I want to know what you think, even if you disagree. Anyway onto part two of the American horse slaughtering blog entry. Around DeKalb people are wondering what pending and recently passed federal legislation might mean for the Cavel International horse slaughtering plant and its 50 or so employees. Posted by dr. gonzo in Horse Slaughter, Politics. First, I haven’t posted the last couple days, I have been busy writing and pondering this mixed up crazy game called life. Saw this column in the Northern Star, here in DeKalb, yesterday and had to respond. Interesting, the author claims ethnocentrism in horse slaughter protests, never heard that argument but its the most absurd thing I think I have ever heard. How can one justify ignoring our own culture in favor of the cultural sensitivites of others. This is PCism to the max folks. This is where people forget that Americans have things that mean something to them too. No one is suggesting Europeans can’t eat horse but Colin Leicht’s column asserts to not allow Europeans to come to America and slaughter horses for profit, trust me, Velda makes a big profit, is somehow ethnocentric. Thats’s ridiculous. Should we go to India and set up cow slaughtering facilities? The Indians would go ballistic, as they should, its a direct affront to their culture. Hmm. Kinda like horse slaughtering. If people have opnions, that’s fine, you don’t even have to agree with me, but for God’s sake back your argument with something besides big words. I’m not impressed. I highly doubt the reason that more than 85% of Americans find horse slaughter objectionable has anything to do Pope Gregory III decreeing in 732 A.D. “that Christians should not follow the ‘execrable practice’ of horse consumption. ” Come on Colin, you can do better than that. I guess the Dallas Morning News beat me to this, but the USDA has established a fee-for-service inspection program for facilities that slaughter horses, such as Cavel International, here in DeKalb. The USDA Food Safety and Inspection Service’s press release can be found here. The gist of it is the FSIS knows that Congress cut federal funding for inspection of horses for slaughter. However, FSIS says that this prohibition of funding does not relieve FSIS of the responsiblity to inspect these animals. I knew that was coming, If you scroll down to my Jan. 9 entry on this post you will see what I thought of this so-called “Congressional intent” to stop horse slaughter. They stopped funding, they didn’t stop slaughter and any idiot can see that if you read the text of this summer’s agricultural appropriations bill which started this whole furor. If Congress plans on stopping horse slaughter they will have to do it outright, through bills pending in both houses of Congress. 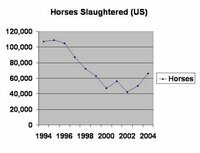 A steady decline over the last decade is the first thing you notice when you look at the numbers relating to horses slaughtered in the United States. 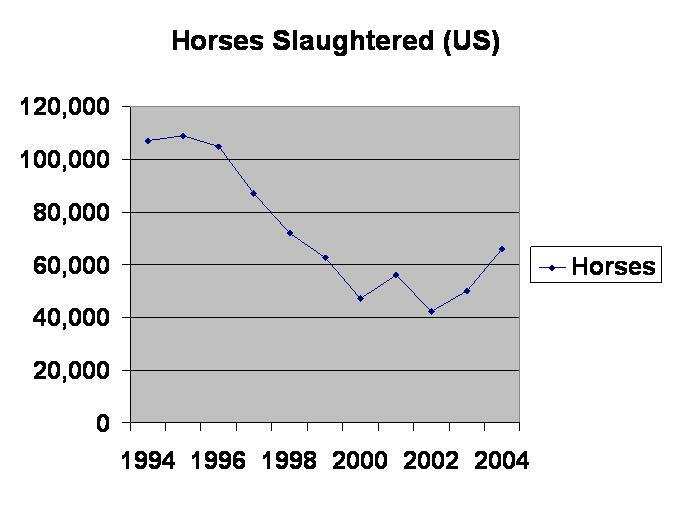 This , although, 2004 saw more horses slaughtered than any year since 1998. And I know this is kind of boring but if you read on this post gets more entertaining, I think anyway. Click on the graph to the left and you’ll see what I mean. (Graph compiled from USDA Annual Livestock Reports 1994-2004). Clearly there are less plants in operation today than there were in 1994. The Cavel West Plant in Redmond, Oregon suffered a toasty fate at the hands of animal rights activists during the last decade. Interestingly enough, the DeKalb Cavel International horse slaughtering plant suffered a similar fate, though it was later rebuilt after having its relocation elsewhere in Northern Illinois rejected a couple of times. The USDA was quick to respond to my inquiry concerning horse slaughtering numbers. First, I was quickly thanked for my inquiry to the National Agricultural Statistics Service, which they told me is the NASS in case I was an idiot or a moron or both . . .
(*DISCLAIMER* What follows is a fictional account of a federal employee responding to an email inquiry I sent in, though just how fictional remains a point of “heated debate”). The team reeled back at the utter stupidity of such an inane request. “How dare these stupid, taxpaying fools waste our precious time with such trite nonsense?” One of the team wondered aloud. “How dare they indeed. We’ll show them,” a glimmer of hope and anger sparkled in one of the email-responding team, team member’s eyes. She looked around, laughed a bit, and then returned her gaze to the dim, blue shine of her monitor. The others laughed and returned to their own email responding. She began a frenzy of typing, lips pursed. She had stayed up late many nights, pouring over page after endless page of electronic agricultural statistics, dreaming of this moment. The moment when she could make a complete stranger feel stupid. The joy that would befall her then, oh the joy. She knew just how to get to the information, about, what was it again? Oh, horse slaughtering, that’s right, she thought. Stupid animal rights activists. She kept typing. This was too perfect. NASS has information on horse . . ., she typed. On our website . . . at the top of the page click on Publications on the right, the letters were flying off her fingertips now. Click on “Title” click on “L” click on Livestock . . ., her thoughts were almost too fast for her fingers. Slaughter scroll . . ., forget commas now, this was war. To the bottom and click on Related Reports click on Livestock Slaughter — Annual Summary click on the PDF . . ., no commas and random capitalization, she thought, this is gonna be great. She smiled slightly. For Livestock Slaughter Annual Summary 03.04.05 go to page 90. Whew. She almost said it aloud, she glanced up briefly, her co-workers hadn’t noticed the sweat that had begun to bead on her brow. She read over her response to make sure she hadn’t missed one intricate step. This idiot will never even realize I was being so smug, she chuckled a little at the thought. As an afterthought she added a few helpful resources and even answered the question about the report for the 2005 horse slaughter numbers directly. The 2005 statistics will not be published until 03.03.06, she typed feverishly. She added in the references she thought would make the email seem especially earnest and concerned but thought better of the gesture right before clicking send. Click on Livestock and seed. Click on Livestock and Grain Market News Portal . . ., I should add LGMNP in parenthesis, she thought smiling. Type horse slaughter in the search box. Good luck with your search. She added a contact us again line and her signature and clicked send defiantly, happy in the moment. Thank you for your inquiry to the National Agricultural Statistics Service (NASS). NASS has information on horse slaughter on our web site www.nass.usda.gov. The 2005 statistics will not be published until 03.03.06. You may also want to review the Agricultural Marketing Services web site http://www.ams.usda.gov. Click on Livestock and seed. Click on Livestock and Grain Market News Portal. Type horse slaughter in the search box. Good luck with your search. Please contact us if we may be of any further assistance. know I said I was going to post about the Federal Meat Inspection Act but I got that email and couldn’t resist. I will post about it in my next update, promise. A couple things I was thinking about concerning this not-so-large controversey (there are only 3 horse slaughtering plants in the entire country). This is probably why no one seems to know how many horses are slaughtered in the United States each year. I have seen numbers from 50,000 to 100,000 quoted in news stories, Web sites, and other sources. The high end estimates usually come from the anti-slaughter advocates and lower ones from slaughter supporters. The U.S. Dept. of Agriculture had a 2004 Livestock Report available here. (Ctrl+F “equine,” its a 103-page PDF). It states 66,183 horses were inspected for slaughter in 2004. Right in the middle of the extremes. And to be expected certainly. The Fund4Horses actually reported these statistics accurately. The USDA livestock reports going back to 1994 can be seen here. And reports going all the way back to 1964 are available as well. 2005 is not yet available online, I asked them for it, they said they’d get back to me in 5 days. It appears that commonhorsesense.com is still owned by one John Linebarger, a Fort Worth attorney known to represent Bel Tex Corp., the Fort Worth horse slaughterhouse. Both Whois.net and InterNIC state that the domain expires on April 30. So in case you didn’t already realize it, facts are hard to discern in this debate because each side is so vehement in their arguments. I read that by allowing commerical inspections (i.e. slaughterhouses paying for the inspections themselves) that they would be violating the Federal Meat Inspections Act. I wonder if that’s true. The opinion pieece linked above on the number ‘100,000’ is where I read it. The writer says that the law allows inspections performed and funded by the USDA only. I aim to find out. There is another side to this horse slaughter debate, even here in DeKalb. There are a number of prominent horse-related organizations and verternairy associations which endorse horse slaughtering as a humane alternative for owners of unwanted horses. mention of horse slaughter which endorses horse slaughter: (most relevant parts highlighted). “An option unthinkable by many horse owners (and we respect these owners’ beliefs) is slaughter. There are three horse processing plants in the United States where approximately 50,000 horses are processed annually. Horses that are processed are traditionally unserviceable, vicious or otherwise unacceptable in today’s equestrian community. The American Quarter Horse Association is a 353,000 member (2004) whose mission is, among other items, “To record and preserve the pedigrees of the American Quarter Horse while maintaining the integrity of the breed.” Membership in AQHA has increased from about 166,000 in 1985 to the 2004 353,000+. Over 65,000 of the group’s members reside in Texas or California. 7,324 Illinoisians were members of the AQHA in 2004. Find out what an American Quarter Horse is here, (from AQHA). They are a veterinary organization established in 1954 by 11 veterinarians, “equine practioners.” Today, they are over 8,000 “equine practioners” in the AAEP. Their online history is available here. The AAEP has a position statement on the transportation and processing of unwanted horses available here. I’ll get back to the AVMA and what “humane manner” means after I talk about their stance on the horse processing industry in the United States. But first a bit more on the AAEP. The organization has a postion statement on H.R. 503 as well (S. 1915) which I blogged about here, here and here, as well as if you scroll down to the Jan. 9 update on this page. Read the entire H.R. 503 position statement PDF here. Now, back to the American Veterinary Medical Association. The AVMA is a non-profit association which was established in 1863. The group represents more than 73,000 veterinarians working in all range of occupations from government to academia. So the AVMA agrees with AAEP, whose statement on transportation and processing is linked above. In addition to those organizations and links there are others, with varying positions, or questionable positions as some might claim. Some are listed below. The Horsemen’s Council of Illinois (affiliated with the American Horse Council) has a number of pro slaughter resources as well as links to the position statement of the AQHA, AVMA, AAEP and the Illinois Farm Bureau. Overall, it seems alot of large organizations support horse slaughter for human consumption. This story appeared in the Dallas Observer today. It appears someone’s horses ended up at an auction attended by several “killer-buyers,” a term applied to folks who purchase horses specifically to sell them to slaughter houses. This was all unbeknowst to them. Stories like this is one of the arguments often found on anti-horse slaughter advocates Web sites against horse slaughtering. Just FYI my next update will center around those in support of horse slaughter in the United States and their various positions. Federal legislation aside the state of Illinois has its own pending legislation which would explicitly outlaw the slaughter of horses for human consumption within the state. This is nothing new, bills have been proposed in the Illinois House and Senate over the last several years, many of them died off in committees or because of the ending of the legislative session. The horse slaughtering lobby must have far reaching power because these bills always seem to vaporize in Illinois and, to an extent, on the federal level as well. This is striking because there are only three operating horse slaughtering plants in the entire nation. If it is truly a powerful lobby that keeps horse slaughter legal that is a scary statement for democracy regardless of what your opinion on the horse slaughter debate is. Think about it like this, if an industry that operates three plants in the United States can wield heavy legislative influence what can a company with an even larger stake in the economic vitality of the country accomplish. Like, say, Ford, or Phillip Morris. The fall of civilization aside the only current bill concerning horse slaughter in the Illinois General Assembly is HB 1171. The exact same bill died last January because of Session Sine Die, fancy latin nonsense for the end of the legislative session. That bill, SB 1921, passed the Senate in March 2003, only about a month after it was introduced. Then it went to the House and lingered in and out of commitee until Jan. 2005 when the Session Sine Die ended the bill’s existence apparantly. Two months later Rep. Robert Malaro, the chief House sponsor of SB 1921 reintroduced the bill as HB 1171 and thus the saga continues. Beltex Corporation, owner of the Fort Worth slaughterhouse is better known, it would appear, as Frontier Meats. Interestingly, Frontier Meats does not mention, on their Web site, the fact that as well as beef and ostrich they also have horse meat for sale. I suppose it’s no wonder considering the widely held belief that public opinion is decidely against horse slaughter in the United States. But the fact that both Frontier Meats and Dallas Crown (as well as its parent company) maintain a web presence is a step beyond what Cavel International and its parent company Velda have put out there. (link in Italian, right click and translate). Driving by the Cavel plant here in DeKalb is highly reflective of the lack of information readily available about the plant and its Belgian owner. The place is on virtual lockdown. Surrounded by wrought iron fences with gated entry ways, its looks like a Cold War nuclear research station from the outside. I half expected to look up at the roof and see a sniper perched, waiting for a trespasser or hapless journalist. It’s almost as if Velda and Cavel have given up the lost PR war and chosen to hunker down and wait out the storm. Remember the email I told you I sent to Velda over in Belgium? (If not scroll down to the Dec. 22 post on this page). They never responded to it, not surprisingly. I guess having your plant(s) “burned down” causes you to coil up a bit. As always, the debate on horse slaughtering in the United States is on going and weird. It seems appropriate to write about it despite my near complacent attitude on the whole thing (other than the fact that eating horses just weirds me out). Considering my vicinity to Cavel why not? The latest on this debate stems from a move by the USDA to circumvent this summer’s agriculture appropriations bill which cut off federal funding for USDA inspections of horse slaughtering facilities in the United States. The first I heard of it was last week but it appears that four legislators appealed via letter to Secretary of Agriculture Mike Johanns, as early as Dec. 13, that they thought the USDA was trying “to ignore Congressional intent to stop horse slaughter.” Here is what the Humane Society of the United States had to say about it. This wouldn’t be a problem at all if lawmakers would just say what they mean instead of using nonsensical clauses buried in gigantic appropriation bills. Such as in this summer’s agricultural appropriations bill. If Congress’ intent was to ban horse slaughter for human consumption then they should have just said that, instead they cut off funding for inspections, which doesn’t really outlaw anything save inspections. If I am not mistaken Sec. 794 looks more like Congressional intent to stop inspections of horse meat than Congressional intent to stop horse slaughter. There is, of course, real slaughter ban legislation being looked at, it is largely bi partisan work too. Earlier posts talked about the legislation here, here and here. Current legislation includes Virgie S. Arden American Horse Slaughter Prevention Act or S.1915, in the Senate. The House version is H.R. 503. Another two bills in Congress deal specifically with the prohibition of wild horse slaughter. These are H.R. 297 and S. 576. S. 1915-Referred to Committee on Commerce, Science, and Transportation on Oct. 25, 2005. Bill Introduced: Oct. 25, 2005. H.R. 503-Referred to the Subcommittee on Commerce, Trade and Consumer Protection on Feb. 25, 2005. Bill Introduced: Feb. 1, 2005. H.R. 297-Referred to Subcommittee on Forests and Forest Health on Feb. 7, 2005. Bill Introduced: Jan. 25, 2005. S. 576-Referred to Committee on Energy and Natural Resources on March 9, 2005. Bill Introduced: March 9, 2005. (This bill was introduced and sponsored by powerful West Virginia Democrat Sen. Robert Byrd). These bills look dead, sorry to say it horse crowd, they have all been stuck in committee or subcommittee for nearly a year. Committees are places where unwanted legislation goes to die. Even the bill sponsored by Byrd hasn’t moved since its introduction on the Senate floor. The Agriculture funding bill is law and was signed in September 2005; it was finally approved in November, Nov. 10 to be exact. The clause about horse meat inspections, as the text above says, takes effect 120 days after the bill becomes law. Today was day 60. Half way there. It should be interesting to see, during the next 60 days, if the USDA intends on ending horse slaughter or finding a way to buck Congress’ not-so-obvious intent. Found an interesting piece (reg. req’d–avoid that) in the NY Times dated Dec. 20. It’s about horses and how they fit into the culture of Kazakhstan. Though I am not sure how well researched this is, maybe the reporter did the story from a bungalow in Maine (hardy har har). The GDP per capita in Kazakhstan was about $7,800 in 2004. $650 per month. Many college students survive on less than that. “Several hundred dollars” is pretty vague regardless. Chevideco, the company that owns Dallas Crown, Inc. (a Fort Worth horse slaughter facility), is not solely invested in Texas. As was the same with Velda N.V. in Belgium the Chevideco company has facilities throughout the world. In existence since 1946, Chevideco has largely been a three generation family company. The Chevideco Web site is a nifty flash site that functions works well. There are a lot of pictures of horses both in sausage and sirloin form and the home on the range form. Strange. Anyway, what do they own? Rekkem–Situated in Belgium this slaughterhouse provides Chevideco with: horse purchase, slaughtering, processing and distribution. They also cut and package horse meat for delivery. Rekkem also imports foreign horse meat for Chevideco, it is the company headquarters. Chevalex Srl–This Romainian company is a slaughterhouse that eliminates the extra step of having wholesalers package the meat when it arrives. Since the summer of 2004 Chevalex has been packaging the meat at the slaughterhouse, which Chevideco really seems to like. They specialize in meat for human consumption. Alpine Export–This facility in New Zealand processes horse meat exclusively for Chevideco. They don’t say much about Alpine other than the meat meets stringent requirements and is mostly delievered via air freight. Interestingly enough, the Chevideco corporate web page doesn’t say anything about the Dallas Crown plant only providing horse meat for carnivore diets in zoos and wildlife parks. “With a view to better going along with the widely divergent wishes of the customers, and to be able to guarantee regularity both in terms of quality and supplies, Chevideco decided to start a new company, Dallas Crown Inc.
Of course, Dallas Crown’s own Web site is pretty specific. If you read my opinion on what the pending legislation could mean for Dallas Crown you will see the problem this presents. Their entire fate, if HR 503 passes (S. 1915), hinges upon whether or not they slaughter horses for human consumption or not. 2nd Entry-Dec. 22, 2005 (I am really bored). “Dallas Crown is apparently a French-0wned company, although this has also proven difficult to track down. Thanks again to the aforementioned paper by Goydon and Kindel I think I may have figured it out (the previously linked site with a slew of info on Multimeat also assisted in this search). The plant is owned by Chevideco but not Chevideco France. Perusing the Internet I found out about this conference for food and beverage producers, packagers and the like. And I found this document which provided the names of the companies involved in the show/conference and their booth number as well as their Website (if they had one) and nation of origin. The only reason I stumbled on this is because Velda was in attendance and thus this came back as a result in one of the various searches I attempted. I was like, hmmm that’s not France so I copied the link and went to the site and low and behold these folks own Dallas Crown! So the writers of the paper I and other information relied on were incorrect. It’s amazing what you can find out without really doing anything, like say, calling France or Belgium, forget that noise. Anyway look for another update soon because reading their site and Dallas Crown’s gives me a few thoughts to opine. Better contact info for Velda Group here, I think anyway. I never heard back on my email to the address provided by the Belgian business guide. I found a different email address, velda@velda.be and it has yet to kick back to me, the business day should be well underway in Belgium and the site linked above says they only employee 43 people so I doubt it’s so clogged with red tape as to stop them from seeing my email. So there is the other side but some interesting debates were raised in November in the Niagara Falls Reporter. The first one is about carcinogenic horse meat, the second one (which actually ran first) is about a Congressional snow job and horse slaughter. Interesting reads they are. Other interesting notes, from December: Kaufman moves to shut down Dallas Crown, Inc.
Also the Belgian Embassy in Washington D.C. has a corporate directory which has listing for Cavel under the auspices of the Van Damme Holding Company, if you click on the little flag to the right of the entry you get correct contact info for Velda N.V., the parent company of Cavel Int’l or Van Damme Holding Company. No web page though, that’s it for now. Adieu. –I have obviously inserted some of my opinion in my blog posts, good practice editorial writing it is, but if this ever reached any print publication it would, of course be presented in an entirely unbiased manner. Something I have become increasingly skilled at is the ability to remove myself from stories enough to suppress any bias. If nothing else, I am generally fair. Which is why I hope Rep. Ruth Munson really does call back. I want to give her side of the story, if I am completely off target I will point that out, if I am right I will also point that out.